Would you like to stay up-to-date on the news around campus? Sign up for our Monthly Parent and Family Newsletter here! With great stories on featured families, student resources and academic and athletic events, the Parent and Family Newsletter is a great way to stay in touch with your young adult’s future alma mater. NEW: Parent and Family Handbook 2018-19 Released! We are excited to introduce you to our brand new 2018-19 Parent and Family Handbook! 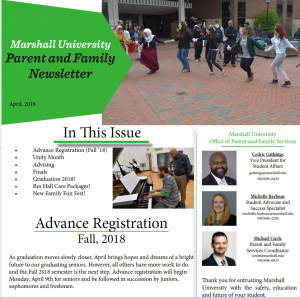 With animated turning pages, detailed descriptions of offices, colleges and programs and a plethora of full-color MU photos, the 2018-19 Parent and Family Handbook is your go-to for all things Marshall University! Visit the links above for your copy of the handbook. Download your copy today by clicking the down arrow in the top left corner (visible when mouse cursor is over handbook photo). You can also SHARE the handbook with others by clicking the share link in the top right corner. This year’s edition of the 2018-19 Parent and Family Handbook is sure to give you the info you need, but that doesn’t mean we don’t take calls! Call the Office of Advocacy and Success or Parent and Family Services any time at 304-696-6833 or email us at parents@marshall.edu. 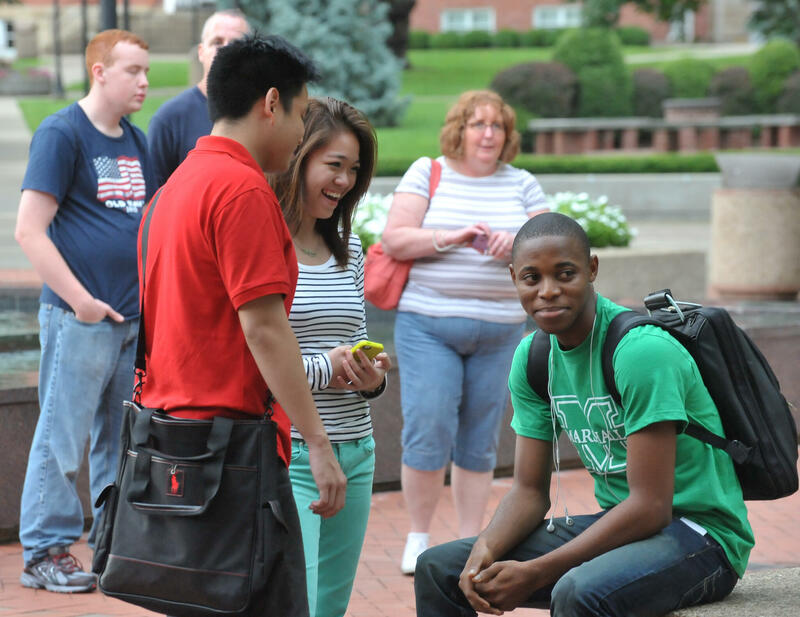 Every new semester, Marshall University undergoes a transition with the arrival of new sons and daughters. 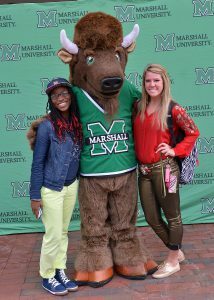 We are by your side as the Marshall community grows and changes in exciting new ways. Parent and Family Services can assist you and guide you through the resources and administrative processes of the university. Think of us when you have any questions about campus, housing, student organizations, or anything concerning your role in your student’s college success. 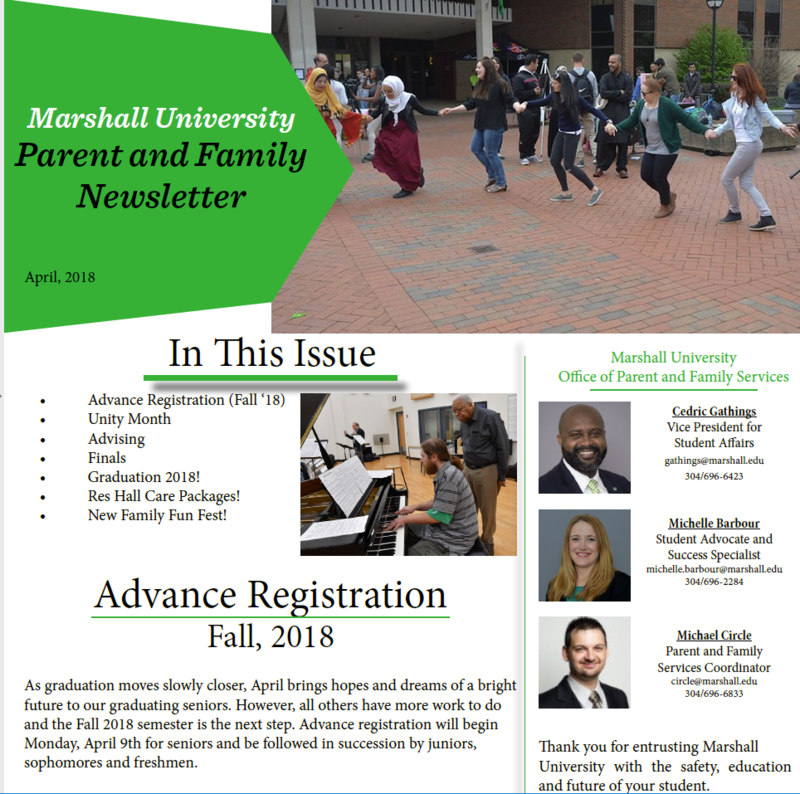 Be sure to check back here for exciting updates, featured college articles and more from Marshall University’s Office of Parent and Family Services! T he Charles and Victoria Rappold Scholarship has been established as a renewable scholarship for West Virginia residents who are undergraduate students in good academic standing. The Rappolds say they established the scholarship because they wanted to help West Virginia students have some of the same opportunities they have had in life. Charles Rappold is a 1970 graduate of St. Joseph Catholic High School in Huntington and a 1974 graduate of Marshall University. After receiving his bachelor’s degrees in history and political science from Marshall, he attended law school at the University of Virginia. After completing his education, he worked as an associate attorney before holding a variety of executive positions at The Bank of New York for 18 years. In 2014, he retired from the Convergex Group as vice chairman and chief operating officer. 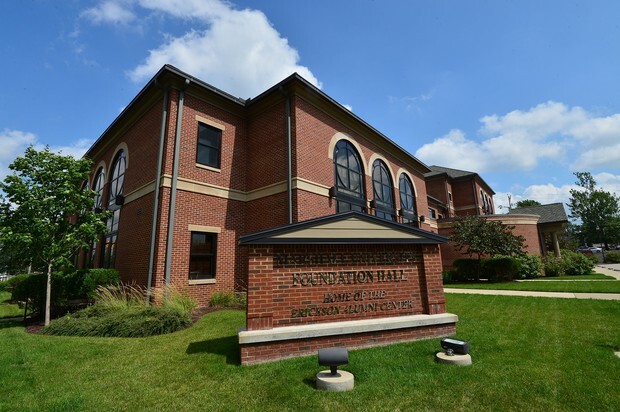 For questions about a student’s eligibility for the Charles and Victoria Rappold Scholarship, please contact the Office of Student Financial Aid at Marshall University. For questions about starting a scholarship at Marshall, please contact Krystle Davis at the Marshall University Foundation by phone at 304-696-6781 or by e-mail at krystle.davis@marshall.edu.